A couple of weeks back, I was contacted by Humane Society International about their upcoming Humane Choice Breakfast on Wednesday August 14, 2013. Because I had to teach at 9 am, I was not able to attend. However, the issue to be discussed in the event is something I have followed since June this year, when the Minister for Business Services and Consumers, Deputy Premier John Rau proposed the new industry code to define “free range”. Hence, the post will focus on one of our most important food sources, eggs. 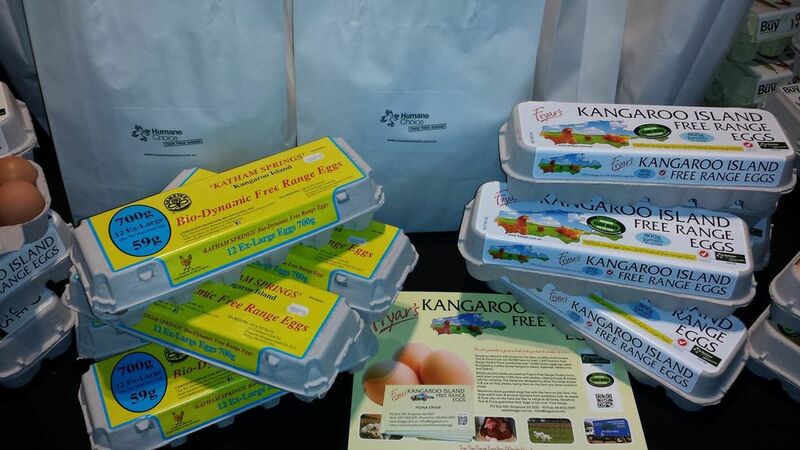 The breakfast was held at Adelaide Convention Center, featuring products from two of South Australia’s great true free range producers. 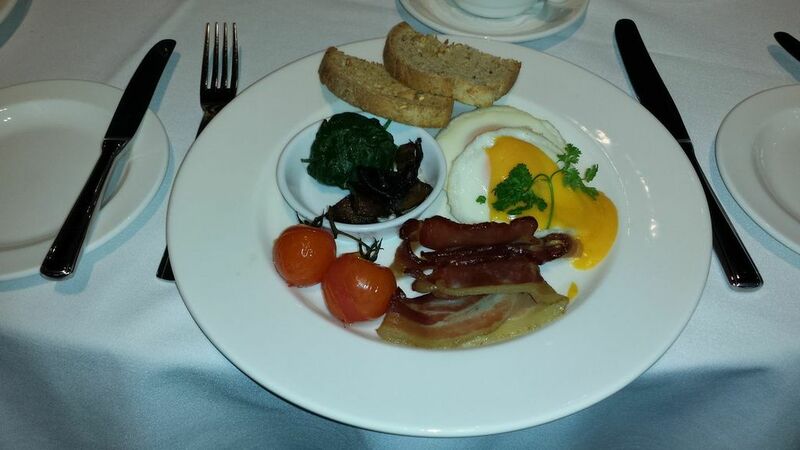 On offer at the breakfast were pasture raised free range pork bacon from Skara Artisan Smallgoods as well as biodynamic free range eggs from Kangaroo Island Free Range Eggs. Although I have not tasted the cooked dish, it looked delish and mouth watering :P. I am a regular consumer of KI Free Range Eggs on weekly basis and my wife absolutely love using these eggs to create baked items. Hence, I know the good quality of their eggs and the sensory features of the eggs. For Skara products, they are not new to me neither. I came across them in the Cellar door wine festival one year and since then just became so addicted. Fortunately they stock in Foodland Frewville which is close to my place. I haven’t tried this bacon product yet but it’s on my radar now. 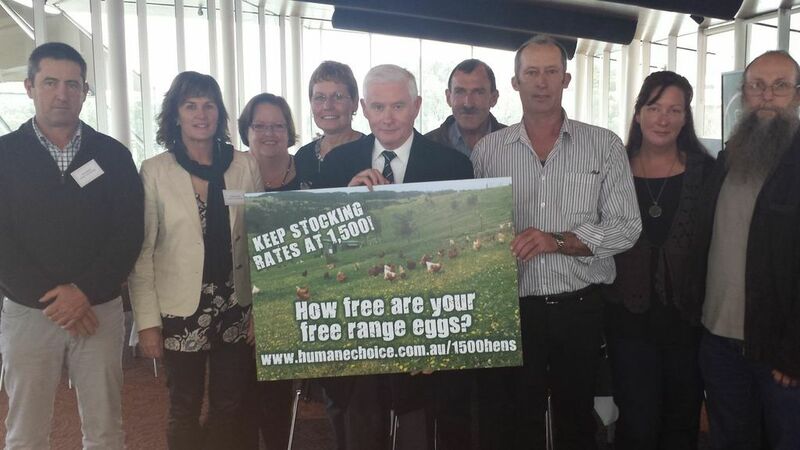 During the breakfast, 18000 postcards signed by South Australian consumers were presented to the Minister for Business Services and Consumers, Deputy Premier John Rau to support true “free range” egg labelling where no more than 1500 hens are kept per hectare. In Australia, there are three housing systems for egg productions, including caged, barn and free range systems. However, since there has not been a national definition of “free range” set by the Federal Government, each state has their own standard towards “free range” labeling. Currently the Model Code of Practice for the Welfare of Animal – Domestic Poultry sets guidelines for the minimum standard of a free range stocking density of 1,500 birds per hectare. NSW, TAS, SA and WA all have Bills before parliament to cap the free range density at 1500 birds/hectare. In July 2013, the Queensland government lifted the number to 10000 birds/ha. Not only on a state government level, but also the two giant supermarket, Coles and Woolworths currently allow 10,000 birds/ha for their eggs labelled ‘free range’. To respond to the lack of action by the Federal Government in setting the national standard of free range labeling, South Australia has stepped forward. In June 2013, John Rau announced a new industry code to define “Free Range” eggs in South Australia with a clear definition of 1500 hens/ha. If the new voluntary code is passed, South Australians will be the first in the country to be able to easily distinguish true free range eggs. Once approved, true free range eggs in South Australia will display a label saying “South Australian Laid, Free Range Egg Code Compliant”. People reading this post may wonder what has this new standard to do with them. This is absolutely normal action because this post is not too much food related. I want to specify this question in two aspects. First, being a consumer, we have the right to know what we purchase and what we eat everyday. Australians have been misled on this issue for long. Indeed, I am very glad to see my state, South Australia is on the move to a clear standard so when I buy my eggs, I know exactly what this “free range” label means! On the other hand, consumers can get a better taste with real “free range” eggs. This is true! To taste the differences between a free range egg and a caged egg, consumers can boil the egg in plain water to cook thoroughly. When cooked, take apart the shell and taste test the egg white and the egg yolk. Note the color variation in the yolk color and the taste. Using Kangaroo Island Free Range Eggs products as an example, their yolk shows a brighter, yellow to pale orange color with creamier taste on palate and complex fragrance on nose, whereas a caged egg yolk would normally show a yellow to pale yellow color and less flavours when tasting. 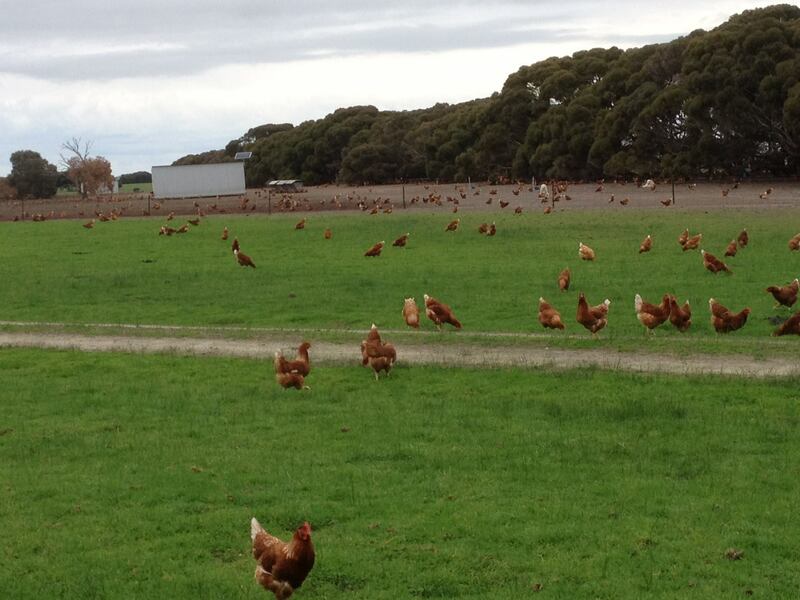 The following photo is showing the living condition of hens at Kangaroo Island Free Range Eggs, a Humane Choice producer. 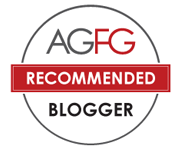 Humane Choice is the certification scheme launched by Humane Society International (HSI) in 2006 to ensure the highest standards of animal welfare and providing a guarantee that the animals are truly free range. Go to www.hsi.org.au to learn more. To get in-depth information, please visit Humane Choice website. For business wanting to know more about the accreditation process, visit the official page for up-to-date information. At the end of the day, how free ranged are our eggs and hens? We regularly buy free range eggs but only until last month, we read something about the “free range” label. Thanks for the info and clarification. Thanks for stopping by Shannon. 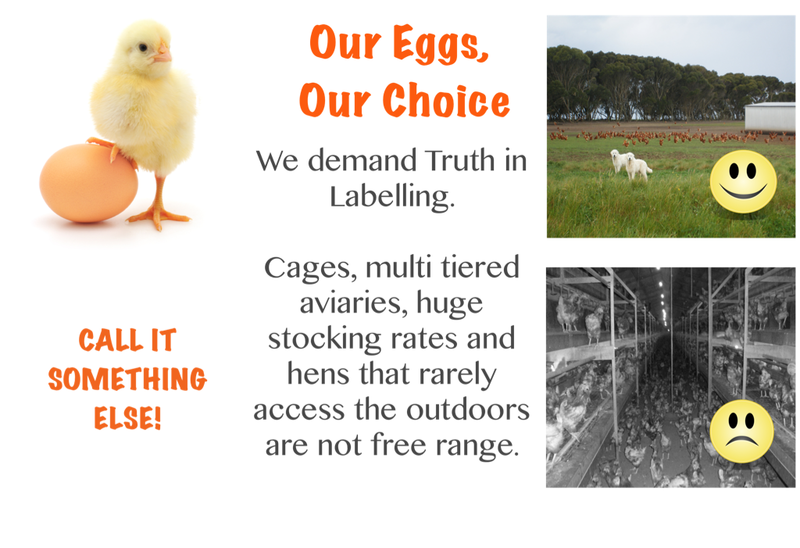 I really hope that SA can be the first in the nation with real “free range” labels. After reading this post, I decide to go and buy some real free range eggs tomorrow! Have a good nite, foodies. I always buy my eggs from a shop (can’t remember the name) in the central market and it costs $3.80. Would the “real” free range labelled eggs be more expensive? i think i;m not to concius about the free range or caged, but i always use the salmonella free…..
That should be a big thing to watch I think. If it’s not salmonella free, we can’t eat running eggs! 😀 Thanks for the info. Are McLaren Vale “free range eggs” from Coles and Woolies really free range then? Probably not. They’re owned by Days, who are compliant with the national standard (10,000 birds per hectare) but not the state standard.